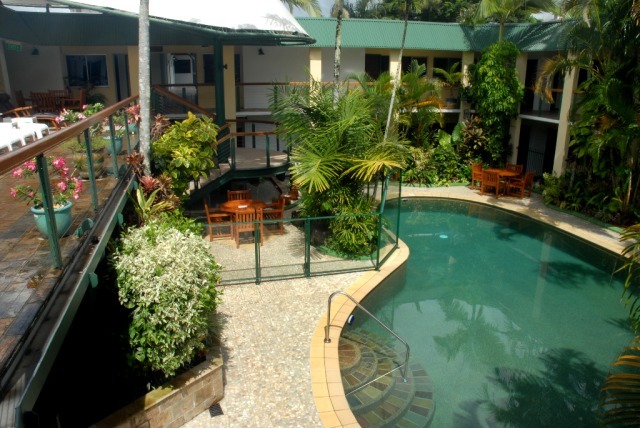 Bay Village Tropical Retreat & Apartments is located just a 3 minute walk from the Cairns Esplanade and 15 minutes from the City Centre. 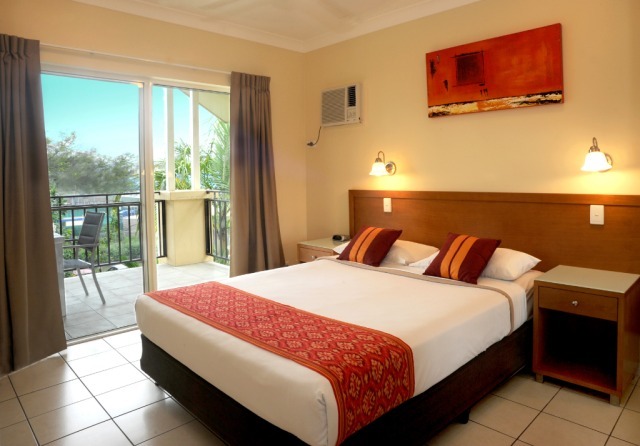 Situated amongst tropical lush gardens, Bay Village offers some of the largest fully serviced hotel rooms in Cairns, with a range of accommodation styles to suit all needs. 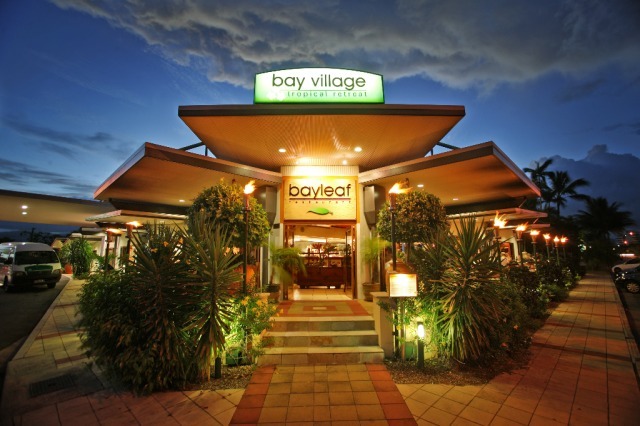 A must to try and a popular spot with the Cairns locals is the Bayleaf Balinese Restaurant serving authentic Balinese cuisine. 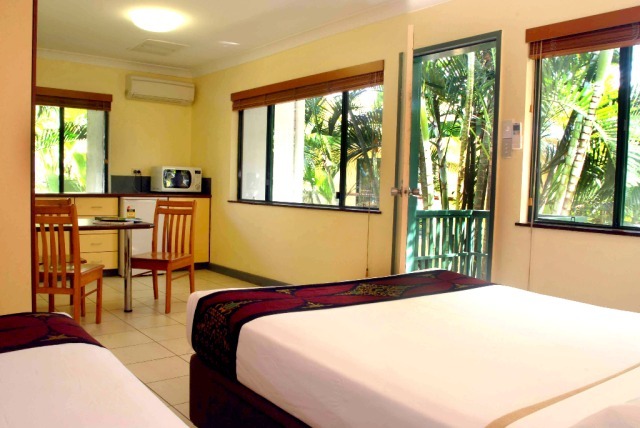 All Rooms feature cool tiled floors, natural colours and local furnishings that reflect the tropical style of North Queensland. 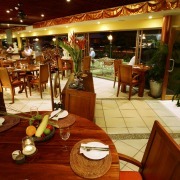 Bayleaf Balinese Restaurant is an award-winning restaurant offering authentic Balinese Cuisine in a tropical setting. All dishes are beautifully presented on a centre platter with lemongrass, flowers and chillies. 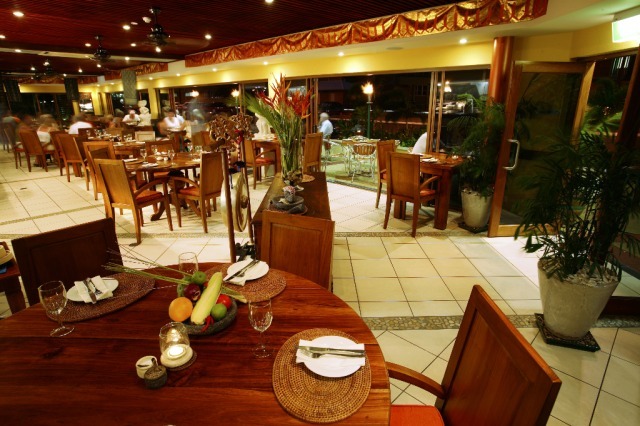 Bayleaf Restaurant's modern menu includes plenty of fresh local produce. Reservations are a must! If all rooms are being updated especially bathrooms would warrant an excellent. Restaurant definitely 5 star. overall happy with everything. a bit far from the city but not a big issue for us. Lovely welcome - helped with all info about Cairns and our days out. 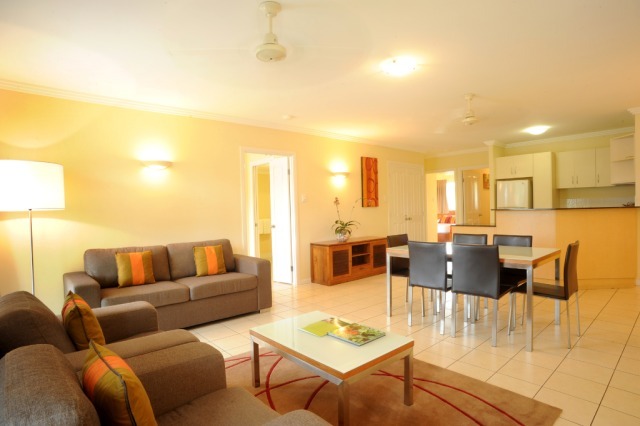 Lovely atmosphere and gardens combined with family friendly envioronment made this a good choice for families. Fantasic restaurant. Very friendly staff at reception and restaurant. 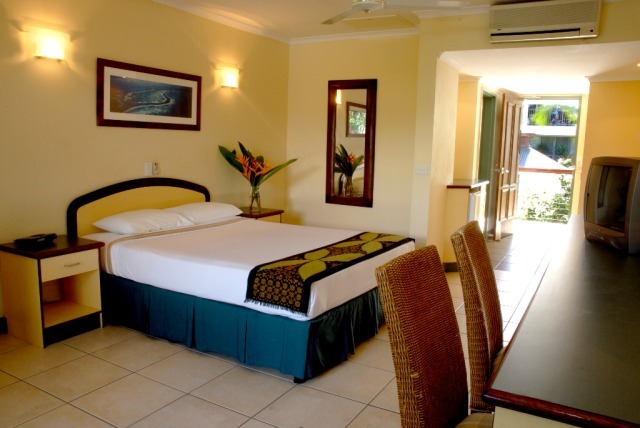 Clean facilities, comfy bed and nice surrounds. Great value for money, will revisit again. 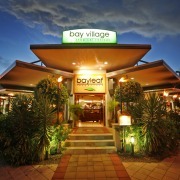 The restaurant at Bay Village was excellent and the pool and staff were great. The room was tired and noisy but comfortable. Great value for money, will revisit again. Value for money, close to town. Beautiful, felt like you were walking into bali every time you got to the front door. 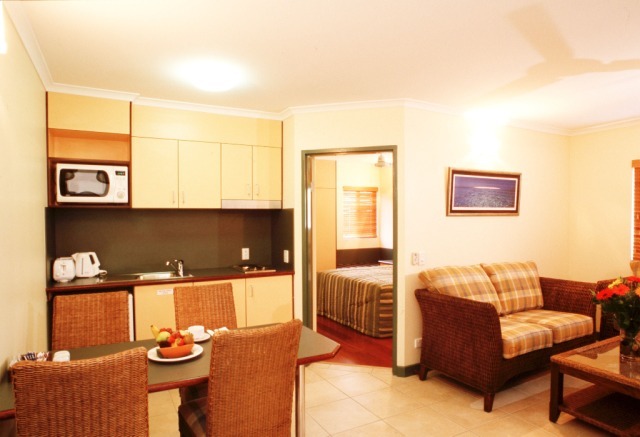 Excellent room, service and value for money. I would definitely return to Bay Village for the next holiday. 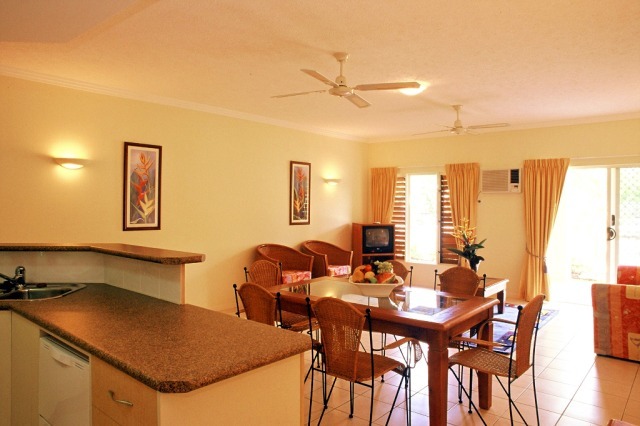 Convenient location and good overall facilities and service. All we needed. Very helpful and try hard to meet any requirements by their guests. Bay Village has a tropical air and was quite pleasant. We received excellent service. Very great hotel, clean & comfy! 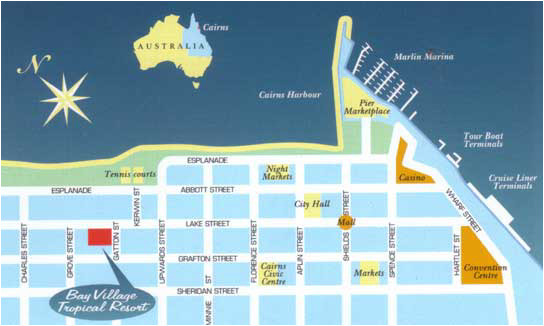 A super hotel although quite a long walk to main facilities - lagoon, harbour & town. However the esplanade made the walk very enjoyable! 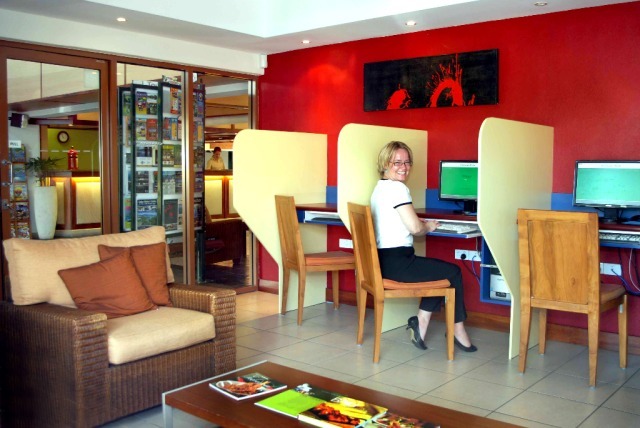 Staff were great - very helpful and always smiling. Breakfast was exceptional. 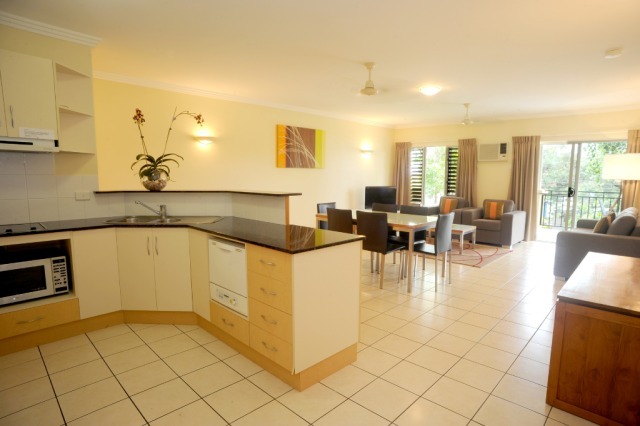 Rooms clean and tidy. My only complaint was that overnight the rooms were too bright with outside lighting filtering in throught the venetian blinds. This made sleeping difficult. Other than that, great place! Very pleased with Bay Village. Would stay again. The Bay Village was very clean and in a good location for tours etc, although was quite a walk from the marina. We were a little disappointed with the noise above our room - we were frequently woken by chairs being dragged across the floor late at night. The Balinese restaurant was amazing .... beautiful food and great cocktails. The only thing that made our trip somewhat poor was the weather, which no-one had control over. However saying that we experienced the tropics in a way we never thought we would it was beautiful. Staff were very knowledgable and the restuarant down stairs was not only convenient but delisious. Helpful staff, good transfer to airport, a little walk into town but kept us fit, nice breakfast, fantastic restaurant! 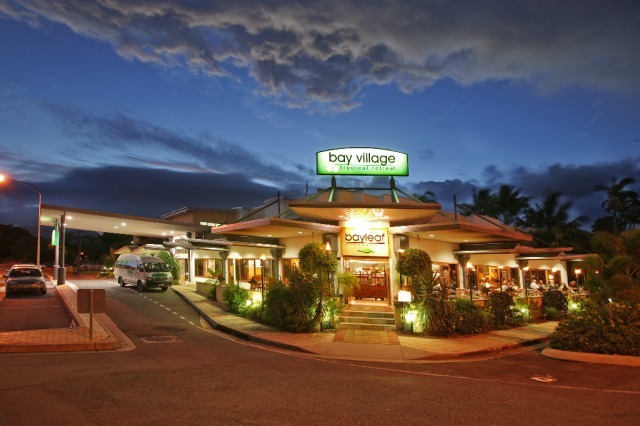 Bay Village was a hotel with an amazing atmosphere, beautiful rooms, and a friendly staff. 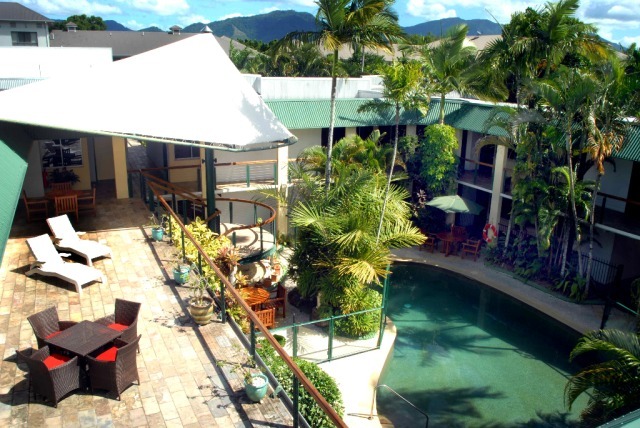 I will definitely stay at Bay Village in my future travels to Cairns. 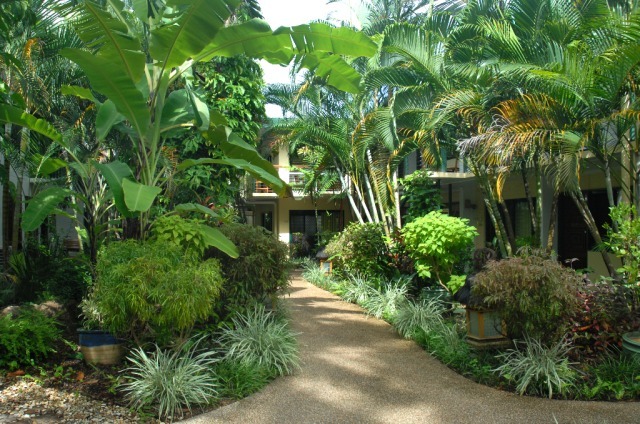 Felt the Bay Village Resort was well positioned for walking to the various city shops and facilities. Good breakfasts. Mostly quite good. The only negative we could find is that the 3 bedroom apartment was located on the other side of the road to the studio rooms. This did not suit the couple with a baby, as it was not a simple matter to do their cooking and washing in my apartment across the road. Everything is new, comfort nice staff there. Especially the price is not that expensive, probably it is low season now.